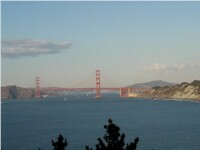 The Golden Gate Bridge between San Francisco and Marin County. The bridge was completed on April 19, 1937. Visitor centers are located at each end of the bridge. Pedestrians and bicyclists can cross the bridge free.